And she was right. I didn’t know what it meant. But on that afternoon the world suddenly opened for me. 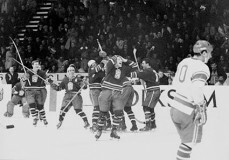 Because I dreamt about becoming Bobby Orr, I turned on a hockey game shown in black and white from Stockholm. 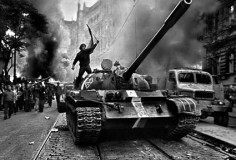 And because I watched a hockey game, I started to grasp how events that occurred miles and decades from where I was born still shaped the world in which I lived: the two World Wars; the Russian Revolution; the Prague Spring. I’ve had the privilege of working as a journalist for more than three decades, covering subjects of all stripes. Yet I’ve learned more about the world through sport than through all my other interests combined:I discovered the differences between Serbs and Croats and Castilians and Catalans covering soccer in Europe in the 1980s; I heard my first strains of bossa nova and drank my first caipirinha with a group of Brazilian fans in a train car heading to Turin, Italy for a 1990 World Cup quarterfinal match. More importantly, I noticed that no matter where I traveled or what story I happened to be working on, the discussion at the dinner table or on the bus or at the bar eventually wound round to sport. Sport was the one subject that seemed to include everyone: the wealthy; the unfortunate; the educated; the illiterate; conservatives; progressives; boys; girls. I created Away Games to help people make sense of an increasingly complex and often frightening world through their interest in sport. Sport isn’t always pretty or positive. Too often it reflects the ugliness and vulgarity in the world in which it lives. But at its best, sport teaches commitment, teamwork, and sacrifice. For the billions of us who watch or play or coach soccer and cricket and baseball, it creates indelible memories that help define us as people, as parents, and as citizens. At Away Games, we believe sport can also create indelible bonds, across time, space, and lives.